Skin that is especially thin and moist is a defining characteristic of the majority of amphibians, whether a toad, frog or almost any other creature in between. The thin skin isn't without an important reason, however. It actually serves a very sophisticated and useful purpose that involves amphibians' respiratory functioning. Damp skin also serves its own important, hydration-related purpose. With skin that is so penetrable, both gases and liquids have the ability to go in and out effortlessly and quickly. This means that oxygen is capable of making its way in and out of an amphibian's skin, and therefore encouraging respiratory processes. This is referred to as "cutaneous gas exchange." Once an amphibian receives oxygen via the skin, that oxygen then travels straight over to the animal's bloodstream. Uber-fragile and thin skin isn't solely advantageous, however. One drawback to the very thin skin of most amphibians is easy hydration loss. To make up for this possible issue, amphibians generally remain in habitats that are particularly damp and wet -- think swamps or areas very close to ponds. That way they can help maintain moist and wet skin 100 percent of the time -- without having to deal with excessive loss of water. Although amphibians generally have the ability to breathe via their skin, that isn't their only means of breathing. Amphibians are equipped with lungs that allow them to breathe as well. On dry land, amphibians only breathe using their lungs. "Skin breathing" is exclusive to underwater situations. Amphibians also sometimes breathe through their skin when burrowing inside of soil for hibernation. Another drawback of the especially thin skin of amphibians is heightened sensitivity. Since amphibian skin is so lean, it is especially responsive to weather swings, pollution in the air and pesticides. Poisonous chemicals that linger in bodies of water can bring upon fatal consequences to many amphibians, as well as birth defects. 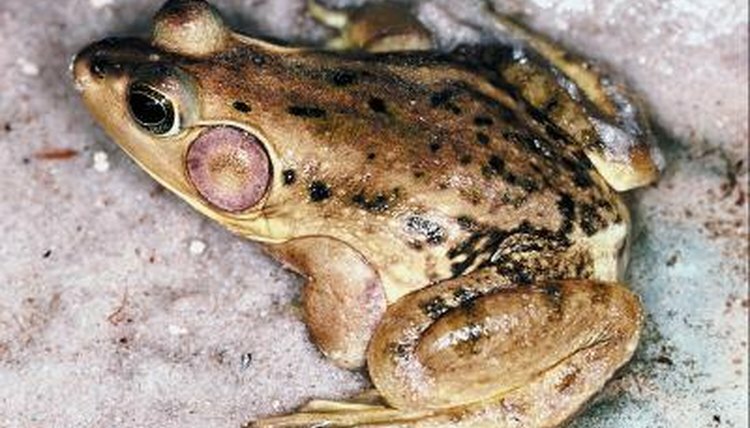 Acid rain is just one specific example of a very harmful situation for amphibians.